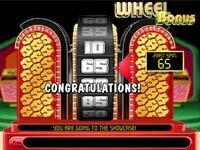 Price is Right features the best music & sounds we've come across in a slots game. The audience cheers you on when you get a big win, and is themed perfectly with 70's sound effects. While on the surface this may look like any regular 5 reel slot, the huge bonus features takes this slot to a different league. We would recommend you try the freeplay version to see for yourself. Like all five reel slots payouts are valid on matching symbols from left to right (on a wagered payline). What makes this slot different are the bonus features. 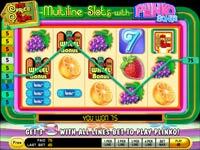 Earn the Plinko Bonus by getting 3 Plinko symbols on the last 3 reels (when wagering on all 9 paylines). An animation will play on the symbols, and you will be prompted to click one of the Plinko Chip symbols.The symbol will reveal the number of chips that you will have for the Plinko Bonus; you may earn 3, 4, or 5 Plinko chips. In the bonus game, you drop each chip, one at a time, from one of three slots at the top of the Plinko pegboard. Each Plinko chip will land in one of the award bins at the bottom of the board. The award value of each bin can vary each time you play the bonus. You accumulate awards with each Plinko chip you drop. The accumulated award total is multiplied by your line bet (for the spin that earned the bonus) to determine your bonus award. (Note this is a completely fair pegboard with 50:50 chance of the chip falling left or right at each peg). Earn the Wheel Bonus by getting the Wheel symbol on reels 1, 2, and 3 on a wagered payline. Spin the wheel, and if you spin between 55 and 100, you will advance to the Showcase Bonus! You get up to two spins of the wheel to earn a chance to advance to the Showcase. The outcomes of your spins are added together to come up with a combined total. If the wheel lands on 50 or less on your first spin, you can choose to take your award, or you can forgo that prize and choose to spin the wheel a second time, hoping to get a combined spin total of 55 or over without exceeding 100. If you choose not to spin the wheel a second time after getting a first spin of 50 or less, you win an award worth the value of your first spin, multiplied by the bet on the payline that earned the bonus, and will return to the main game without moving on to the showcase. If you choose to spin again and get a combined total of 55 to 100, you will advance to the Showcase. There is no award for your Showcase qualifying wheel spin. 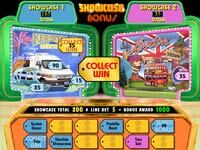 If you choose to spin again and "bust" by exceeding a spin total of 100, you win a consolation award, which is multiplied by the bet on the payline that earned the bonus, and return to the main game without moving on to the Showcase. If you choose to spin again and don't qualify by earning a combined total of at least 55, you win a bonus award equal to the value of your combined spins, multiplied by the bet on the payline that earned the bonus. If your spin total is 55 to 100 you advance to the Showcase. (Each spin is completely fair - no one value is more or less likely than any other). The Showcase offers two award collections, right and left. Choose one, the door opens to reveal a group of items, and six tags appear at the bottom of the playfield. Click a tag to reveal an item in the showcase and an award amount. Keep clicking tags and accumulating awards until you reveal the item with the "Collect Win." Once you reveal the Collect Win item, your award accumulation is over and you'll return to the main game. The accumulated award total is multiplied by the bet on the payline that earned the Bonus to determine your Bonus Award. Within the six tags for the showcase are always five items with award values (one of which has a Collect Win associated with it), and one Double Showcase tag. If you select the Double Showcase tag before revealing the item with the Collect Win, the second Showcase will be revealed and 6 new tags will be displayed-- you are now able to earn awards from both Showcases! Within the 6 additional tags that appear are five items with award values (one of which has a Collect Win associated with it), and one Collect tag. Keep clicking tags to reveal items and accumulate awards until the Collect tag, or one of the Collect Win items in either of the Showcases, is revealed. If the Collect tag is revealed before any of the Showcase items are revealed, it becomes a "Super Collect" and you win all of the award amounts in both Showcases! (You have an equal chance of picking any available tag - the outcomes are not fixed).